There are several controversial theories about the origin of Pärnu’s mystical elephants. An exorcist and sensitive, Jägala Ants, a winner of the communist prediction contest, famous throughout the Union, has confirmed repeatedly that these are mammoths, hiding somewhere in the caves of the beach park. Regrettably, there are no caves in the beach park and an elephant is still elephant and not a mammoth. At the same time, the rest of the theories are even crazier. There is not much material preserved about the elephant and its history: just a few photos from the Pärnu Museum and private collections, one phone from the Estonian National Museum. The bibliophile Olaf Esna writes in Pärnu Postimees: “There were two and a half kilometres of sand beach at the disposal of the vacationers, being “dryly” full of sunbathers on sunny summer days. Two large wooden elephants were built into the water, along the trunk of which one could slide into the water. 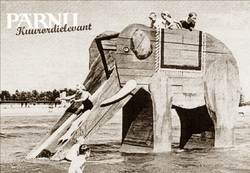 While in the previous year the children had to stand by and watch how the grownups were entertaining themselves, then by summer 1959 two elephants had been built – one for smaller kids in shallower water and the other for bigger kids in deeper water. The ancient city of Pärnu is one of the most mystical places on our whole planet. Ghosts and all sorts of aliens are more frequent here than in Canterville, San Zhi or Roswell. It is noteworthy, that the phantoms and aliens of Pärnu are very family-driven: there are child ghosts, father ghosts, mother ghosts, grandmother aliens, grandfather aliens and even child aliens. All of them are found amicably together, even crows and gulls beside each other and in a jumble on the beach. The usual supernatural phenomena are boring; this can’t be denied. It’s haunting – and so? Came the bachelors from the space and left again. A trivial thing, it’s starting to annoy. But, the supernatural phenomena in Pärnu are absolutely fantastic! Fantastic and unique, as well as healthy, cosy and very nice to look at. No human tests are performed, nobody gets frightened – Pärnu has long and dignified traditions of humanism. Above all, Pärnu is known for its mysterious elephants. You have probably seen on a fridge of some professional pilgrim or notorious philosopher a magnet with a marvellous elephant – shiny star on its forehead. 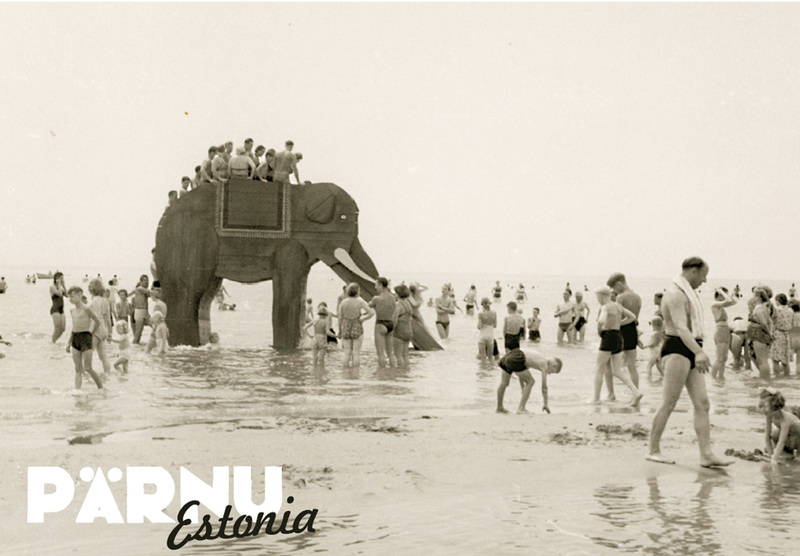 This is one of the Pärnu’s mystical elephants, who appeared on the beach of the cosy health resort already in the beginning of 1950s. First, the golden elephants came one by one or in pairs – this is exactly how Ville Riis, a researcher of native places has described them in his report; however, already in August 1958, one could see elephant herds of many hundred-heads in Rannapark (beach park) or around Kuursaal (resort hall). The officialdom of the proletariat dictatorship suppressed everything that was not in line with the scientific ideology, both the self-sustained fireworks as well as the invasion of golden elephants. Still, despite the silence in media, the rumours spread all over the country. And so, a decent Nordic summer resort became a unique experience. The elephants came from nowhere and brought along a unique light and warm-hearted mood. What’s more, the mystical elephants stomped in the sea for decades and as a result, the medical mud of Pärnu is among the healthiest on the entire planet. This is not a superstition; the medicinal properties of the local mud have been scientifically proven. 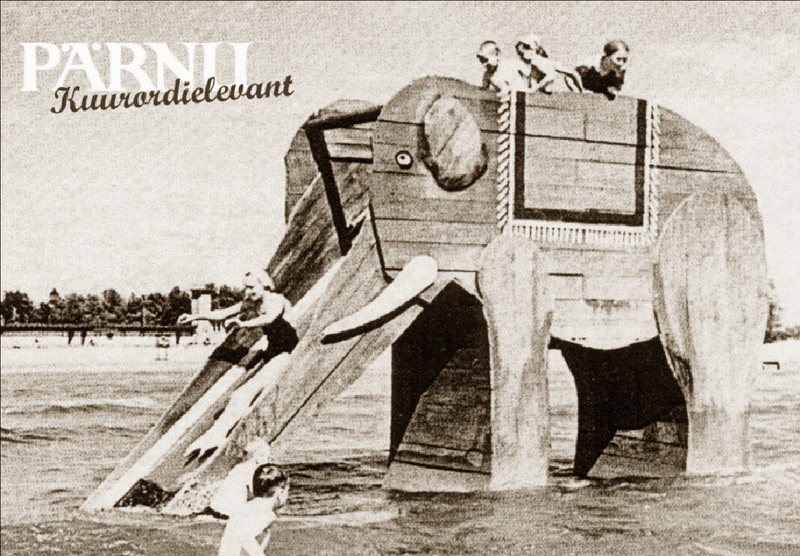 As of today, only one mystical elephant has remained in Pärnu, but the peaceful atmosphere of the fifties has remained unchanged and the health centres of Pärnu continue to serve mankind until the present day.